Professor Raymond P Clark OBE was installed as Master in 2010 and his Guest Speaker at the Installation Dinner was The Earl of Selborne KBE, FRS Chairman of the Foundation for Science and Technology. 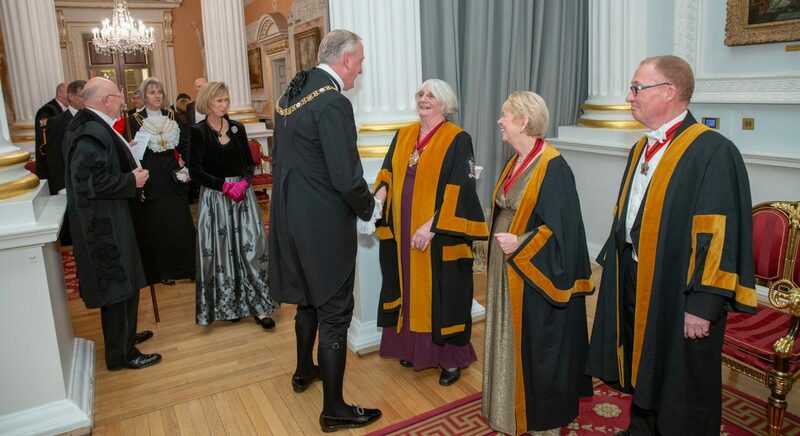 Shortly after, the new Master had the pleasure of hosting a Reception at Gresham College for Masters of Livery Companies who had kindly supported the Petition of the Guild for Company without Livery status. Increasingly, through the good offices of Sir Roderick Floud, Provost of Gresham College, the Company was using the College for its London receptions and seminars. At the Annual Service, sadly at St Olave’s Church for the last time, the Master himself preached the sermon on Science and Religion which was the theme of his Master’s Seminars. This seminar series included the excellent Franklin Lecture given by the Rt. Revd. Dr. Tom Butler, former Bishop of Southwark, and thought provoking and stimulating addresses by Sir John Enderby, FRS and the Revd. Professor Michael Reiss completed the series. Sir Antony Cleaver, sometime Chairman of the Engineering and Technology Board, was the Guest Speaker at the Election Dinner. The Education Committee continued to produce a series of high quality seminars on various topics of education. Speakers included Philip Bujak, Chief Executive of the Montessori Schools Association, Bill Watkin, Operational Director at the Specialist Schools and Academies Trust, Sir Geoff Hampton, former Headmaster, and Patrick Spottiswoode and Jamie Arden of the Globe Theatre. The social programme provided visits to the Museum of London, Charterhouse (Sutton’s Hospital) in Smithfield, Eton College, Tower Bridge, the Houses of Parliament, and St Georges Chapel Windsor. The Masters weekend was a visit to the World War One battlefields in Flanders, an informative and moving three days during which the Company was honoured by being able to take part in the daily service and to process to lay a wreath at the Menin gate on one of the days. The Company developed a relationship with the Cadet Volunteer Qualifications Organisation (CVQO) and the Master attended its graduation ceremony at RAF Cranwell where he presented three awards to cadet trainers. This was a new annual award funded by the Trustees and provided an excellent link to cadet education. Collaboration was also established with RAF 22 (Training) Group which is responsible for RAF training throughout the UK. The Group was led by an Air Vice Marshall who was elected an Honorary Freeman for the duration of his command. The intention was that he would attend some Company functions and there would be joint seminars and visits to RAF facilities by the Freedom. The Company’s Public Speaking Contest and its administrative support for Livery Schools Link continued and, by the end of Professor Clark’s year of Office, the Company and its Trust Fund had almost met the targets for translation to full Livery Company status – over two years ahead of the first date on which it may petition.